Discussion in 'General Banter' started by GazHyde, Nov 17, 2013. 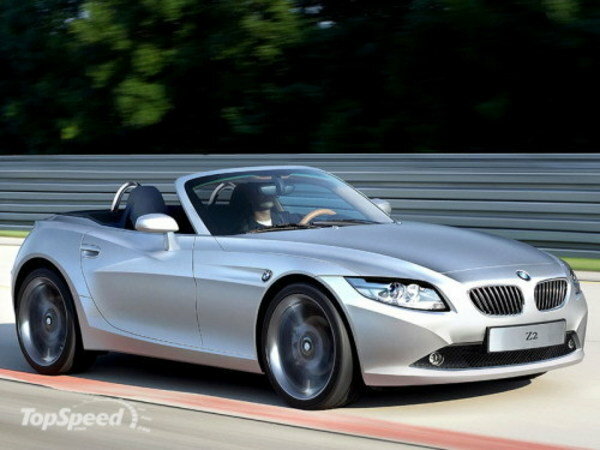 Do you think a front wheel drive diesel BMW Z will ever be a great Roadster? There has been talk for many years now about a Z2, but do you think we will ever see anything of it? Was bored this morning in between sneezes, so been doing a bit of Googling on the subject. "The BMW Z2 will be similar in size to the Z3 and will get petrol or diesel power. A small roadster to sit below the Z4 has been on BMW’s wish list for some time, but not until now has the BMW Z2 project started to make financial sense." "But the most enticing proposition is this front-wheel-drive Z2. It’ll be similar in size to the old Z3, and will use turbocharged 1.5-litre three-cylinder and 2.0-litre four-cylinder versions of BMW’s new modular petrol and diesel engines"
front wheel drive diesel sport car? I think it will give the roadster the acceleration it deserves without going all //M Power, they should do a diesel conversion for the Z3. A few years ago I had a 99 slk c230 Kompressor supercharged. It had power out the wazoo but the supercharger was the weak link as they often failed. At the same time, I had the Honda del Sol which was front wheel drive. While the Mercedes had the head turning looks and the power, it didn't have the handling capabilities of the Honda because of the decreased weight and the front wheel drive. Take out the recognition factor and I would choose the Honda every time. And there is absolutely no comparison in any kind of nasty, icy, snowy weather. I always knew the Honda would get me home. Always worked great in snow with all that weight right over the wheels pulling you along instead of pushing you. Got to walk the doggies. Be back in a minute. Hey Gary, yesterday, I was going through some of the other areas of the web site and I happened on to the 'Massive 44'. My z3 was made in 96. I didn't look at the engine size but perhaps this is the car that I have. If yours is a 1.9, it should be the M44 engine! Let me know if it is, and I'll add you to that group. I looked under the hood at the information tag and the engine is 1895 cc. All wrong in my opinion. People who buy Roadsters may not be enticed to buy if diesel ... FWD also not good, but perhaps appeal more to the younger/hot hatch crowd .. If it will be made at the right price I think it will be good. The front end is in the current BMW front end theme with the kidneys getting wider and lower. FWD should be cheaper to produce and what other small roadsters are about. The TT is front wheel drive and I guess the Z2 if built will be on the mini platform which gets some good reviews. Just reading Gary's link the 2.0 petrol version 'could produce 300 hp' so wouldn't hang about. Go for it I say, as long as they get the price point right. Del Sol and a Mercedes SLK. I owned them both for about 5 or 6 years. I drove the SLK for show, but if I was going somewhere out in the sticks on a good road that was fun to drive, I'd take the Honda every time. It was just that much more FUN. I just don't know what else to say to you about it. Its the experience of driving it. And I can't impress upon you more the extra measure of safety you know you have in the snow. can you believe that out here in Hong Kong, it is an offence for a car to tow a trailer without a permit & no permits have been issues for decades as the Government refuses to issue any ... I was told it was to stop caravan gypsy style living..